In a large nonstick frying pan, heat 1 tablespoon of the oil with 1/2 tablespoon of the butter over moderate heat. Season the scallops with 1/2 teaspoon of the salt and the pepper. Put half the scallops in the pan. Cook until browned, about 2 minutes. Turn and cook until browned on the second side and just done, 1 to 2 minutes. Remove. 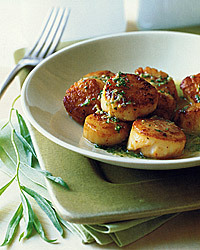 Heat the remaining 1 tablespoon oil with 1/2 tablespoon of the butter in the pan and cook the remaining scallops. Remove. Wipe out the pan. Put the pan over moderately low heat and add the wine. Boil until reduced to approximately 2 tablespoons, 1 to 2 minutes. Reduce the heat to the lowest setting. Whisk the remaining 4 tablespoons butter into the wine. The butter should not melt completely but just soften to form a smooth sauce. Add the remaining 1/2 teaspoon salt, the lemon zest, and the tarragon. Pour the sauce over the scallops. For an extra dimension of flavor with this classic shellfish dish, try a Pinot Gris. Exciting examples are coming out of Oregon.